Click on this link for the Form to Make Rabbi Strauss your agent to sell your chametz. On April 7, the Richie Citron Lecture was presented at KTM. Rachel Danziger Sharansky speaking: "Storytelling and Redemption: How Can We Experience the Exodus as Our Own?" KTM is a proud supporter of Israel. AIPAC is having its dinner on May 5 and for those who want more information click here. Now is the time to join KTM or renew your membership! Current members, click here to pay your annual membership dues directly. Prospective members, click here to apply for membership. We would also like to ask our members to contribute to the Sisterhood Fund by paying their Annual Sisterhood Membership fee. Check your mailbox or click here to learn more about the achievements of our active Sisterhood and pay your membership fee. 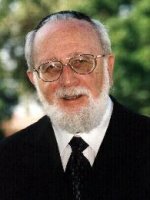 7 Tishrei marked the fourth yahrzeit of Rabbi Abraham Halbfinger zt"l.
A book was published in his memory consisting of divrei torah from many of the now grown men and women who attended Kadimah-Toras Moshe in their youth, words of tribute from community leaders, and words of comfort from the Halbfinger family. If you are interested in having a copy, please contact Rabbi Benjamin Houben (617) 903-3218 in the Boston area or Rabbi Jonathan Krimsky, if you are out of town. There is a suggested donation of $18 for the volume. All proceeds go to the Rabbi Abraham Halbfinger Memorial Fund (information about the fund is included in the book). With classes most days of the week, and regular guest lectures, KTM is dedicated to providing vibrant and interesting shiurim and lectures for the broader community. Last summer we enjoyed hosting students and a shabbaton from the Center for Modern Torah Leadership's Summer Beit Midrash and look forward to their return next year. As you can see, we have a great deal programs and regular learning taking place here. Browse our archive of programs and guest speakers on our events page. Our community is dedicated to providing a welcoming place for visitors and residents alike. Get in touch with us If you are visiting Boston. Whether you need a place to stay, a warm shabbos meal, or have questions and need help moving to the area, please drop in, call, or email! Kadimah provides many opportunities to get involved with and support our vibrant, tight knit Modern Orthodox community. Whether it's participating in religious and social programming, helping with educational opportunities, or with upkeep and maintenance of the shul, we'd love to have you join us. Your support of Kadimah Toras-Moshe through kiddush and event sponsorships, annual campaigns and other donations, sustains and strengthens our unique and welcoming community.